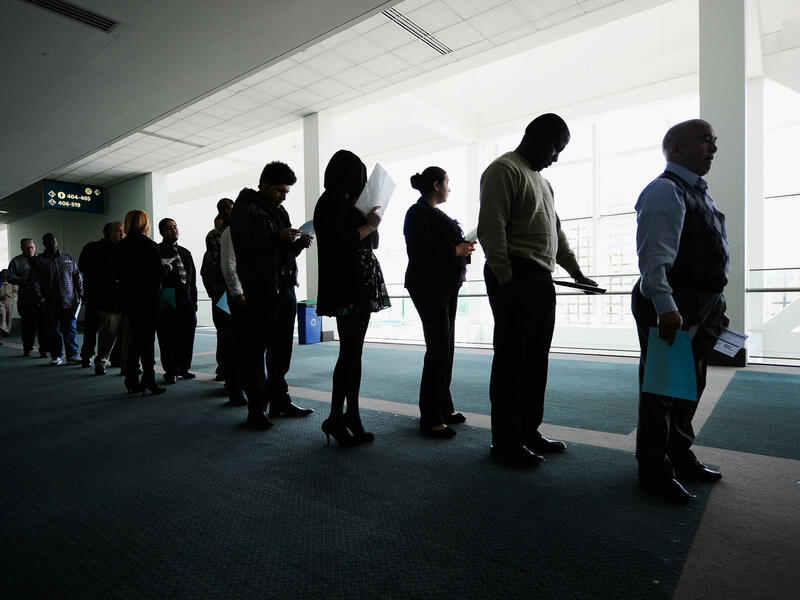 Job seekers line up to enter a career fair in Los Angeles, on Dec. 1, 2010. At the peak of the recession, the unemployment rate hit 10 percent. It's now 4.1 percent. Ten years ago this month, you may not have noticed the cracking and crumbling under you. At the time, you may have had a job, a home and rising retirement savings. Sure, the housing market was hurting a lot, but stock prices were still holding up and Federal Reserve policymakers were offering reasons for calm, saying they expected strong consumer spending. But the Fed was wrong: In December 2007, an economic earthquake already was convulsing the country. It marked the beginning of the Great Recession, which lasted 18 months, becoming the longest recession of the post-World War II period. "There was a lot we didn't see then," said Kevin Logan, chief economist for HSBC. "We didn't see the borrowing that was piled on top of borrowing, and how it had contaminated the financial system." Between late 2007 and early 2009, the S&P 500 stock index would lose about half its value. As many as 10 million families would have to walk away from homes during the foreclosure crisis. From late 2007 to early 2010, payroll jobs would decrease by about 8.7 million, sending the jobless rate to a 10 percent peak. Even when the recession ended, the initial recovery would offer barely a bounce. What caused the upheaval? A Federal Reserve Bank of San Francisco study concluded the recession grew out of "an enormous speculative housing bubble." That happened when low interest rates combined with "lax lending standards, ineffective mortgage regulation, and unchecked growth of loan securitization," it said. The economy has taken years to heal. And the Federal Reserve has been slow to withdraw its easy-money stimulus. On Wednesday, Fed policymakers nudged up interest rates for the third time in 2017. The federal funds rate is now up from near zero to 1.5 percent. That remains far below the pre-recession level of 5.25 percent, but it's closer to "normal" — just like the economy itself. "There's less to lose sleep about now than has been true for quite some time," Fed Chair Janet Yellen said, noting that with unemployment down to 4.1 percent, the jobs outlook "remains strong." As a result, the Fed will continue its "normalization" of monetary policy, she said. Fed policymakers said they expect to raise interest rates three more times next year. So if at last, the country is over the Great Recession, what is the legacy? Economist Logan said that when he looks back, he sees a permanently changed economy. The downturn "left a lingering impact on jobs and on some sectors that never recovered," he said. For example, just before the recession, about 14 million Americans worked in manufacturing; today, that sector has about 1.5 million fewer jobs. And millions of families saw their home equity wiped away in foreclosures, Logan said. "A lot of people lost their jobs and their net worth. And then they had to take a lower paying job. ... It was a blow that they never recovered from," he said. For the economy as a whole, the big change has been the shift in wage and price expectations, he said. Since the downturn, companies have become extremely reluctant to raise prices — or pay higher wages. "Inflation went down and stayed down," Logan said. "Now people feel like: 'I'll never get a pay raise. There's a lid on everything.' "
The Great Recession was "like a big boulder getting thrown into the pond, and the ripples are still keep going out. Everyone is much more cautious," he said. Lindsey Piegza, chief economist at Stifel Fixed Income, agrees the recession shifted the economy to a lower gear. Even after a decade, "I'm not seeing the wage growth; I'm not seeing the capital investments," she said. There may be another legacy: The lingering pain feeds a political desire to have government do more for the economy. On Wednesday, President Trump brought up job losses while touting huge tax cuts. He said Americans have suffered as the country "exported our jobs, closed our factories, and left millions of parents worried that their children might be the first generation to have less opportunity than the last." So by many measures, the U.S. economy is in great shape, with near-full employment, steady growth, low inflation and a rising stock market. But the Great Recession continues to influence public policies involving interest rates and taxes, as well as private financial decisions. John Mike, a Realtor with Re/Max in the West Palm Beach area, hung on to his career through the worst of South Florida's foreclosure crisis. He watched the market peak, crash and then climb back. The housing market is strong again, "but we're still seeing affects from the recession," he said. "There is a legacy of people who come in the door wanting to buy, but they can't because they've had foreclosures," he said. "They are handicapped now" by credit troubles, and must remain renters no matter how much the economy improves, he noted. And for real estate agents like himself, the Great Recession will never really be over. "I keep moving forward, but you can't put it entirely out of your mind," Mike said. Agents are less exuberant and more inclined to save money because, even years into recovery, "you're just more aware of your vulnerability."